This caricature shows Alexander Faris conducting a performance of Sally at the Oxford New Theatre on 26 November 1952. 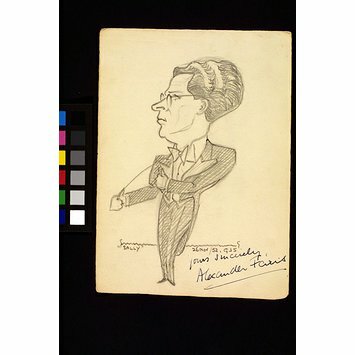 It was drawn by Gilbert Sommerlad (1904-1976), a rehearsal pianist and orchestral violinist at the Brighton Theatre Royal from 1932 until 1936, and at the Oxford New Theatre from 1936 for over forty years. Sommerlad sketched the stars on stage when he wasn't needed in the orchestra pit, compiling the sketches in a series of albums. This production of Sally, the musical comedy by Guy Bolton with music by Jerome Kern, opened at the Oxford New Theatre on 24 November 1952. It was originally produced in London at the Winter Gardens in 1921, and featured the song Look for the Silver Lining. 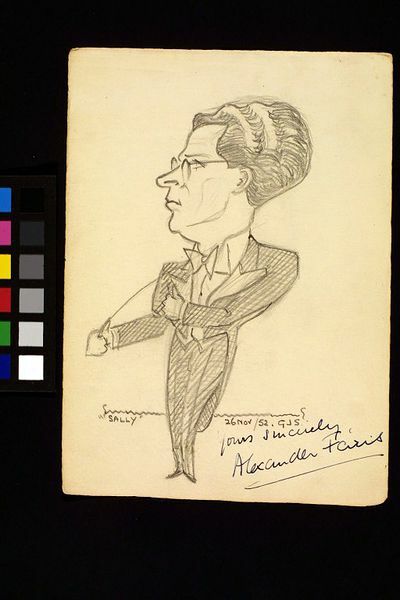 Pencil caricature of Alexander Faris conducting a performance of Sally, dated 26 November 1952, part of an artist's hard-backed sketch book manufactured by George Rowney & Co., called 'The Euston Sketch Book'. The pencilled sketch is drawn directly onto the page (cream cartridge paper). Titled and dated by the artist and signed by the subject.